The Secret Lewis ARG is coming to an end. But they are having one last event which sounds like it will be the biggest one of them all. The stolen trophy is being sent via courier from Abu Dhabi to London and we are tasked with getting it back. The event is free, but you must register in advance if you plan on going. This is your chance to be a hero. With Lewis in Abu Dhabi, we’ve had to figure out a way of pulling off one final heist. Fortunately, we have a secret weapon: you. It’s going to be fun, and it’s free, but you’ll need to register in advance. First, check your diary and make sure you can be at the Apollo Cinema, Lower Regent Street, London SW1 for 6-8pm on Wednesday 10 November. If you’re available, mail London@SecretLewis.com with your name, email address and contact number. You can ask for either one or two tickets, but if you ask for two, make sure you include contact details for both people. Then we’ll be in touch. There are going to be fantastic rewards for everyone who can make it, so clear your schedule. This finale event looks like it’s going to be a blast, so if you’re in the area, try to clear your schedule for Wednesday night. Secret Lewis has been a lot of fun over the last several months and it would be great to show it out in style. The Innovasion is a new “pervasive alternate reality game” that is being run as part of the Liverpool Biennial festival. Something is wrong at the Liverpool Biennial. Suspicious signs and mysterious codes appear from nowhere, and a sinister conspiracy is lurking in the shadows. But the good thing is: You can be part of it! Immerse yourself in a new world, find the trail, unravel the mystery, break the codes and help save the world. Your creativity is under threat. This is only the beginning. Registration is required for the event and costs £5.00. Presumably by registering, you’ll get all the information you need to follow the events throughout the day in Liverpool. If you are thinking about going, you might want to check out the online content of the game so that you know what you’ll be looking for throughout the live event. Third group of cities has been released. We have a twitter update from @avatrix that said he got a phone and a wallet with Tron cards, Flynn Arcade tokens, codes and newspaper articles. Still no word on if there is more than one at each location. 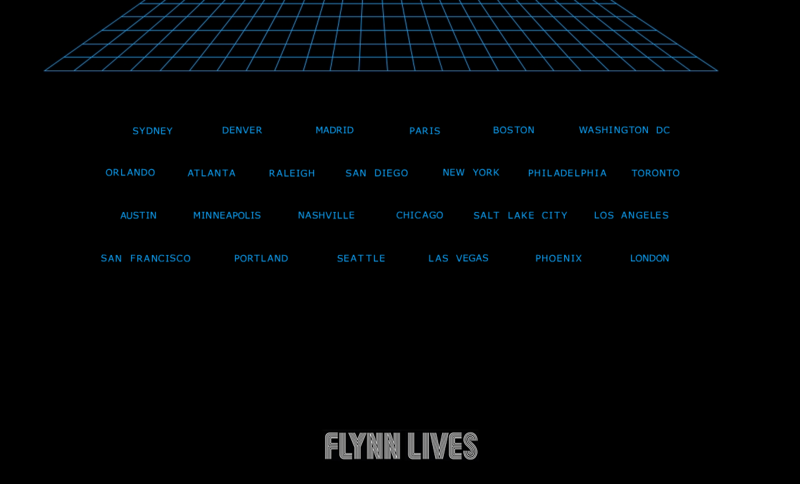 Your contact is traveling through another dimension… while wearing a Flynn Lives t-shirt. Your contact can’t decide which game to play while wearing a Flynn Lives t-shirt. Your contact is defending six cities while wearing a Flynn Lives t-shirt. 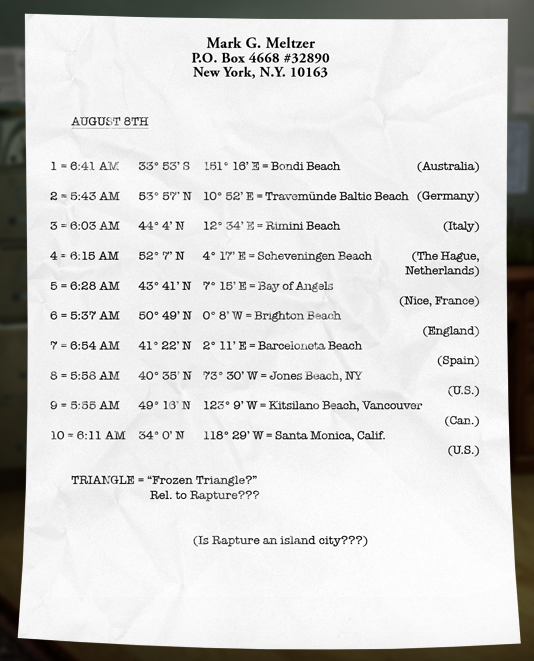 Something in the Sea, the campaign for BioShock2, wants everyone to go to one of 10 beaches around the world this Saturday morning. 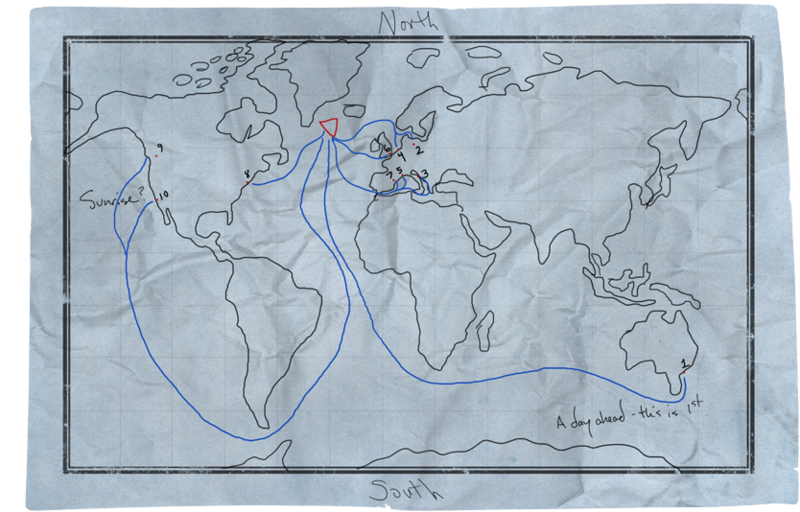 Two memos and a map have appeared on SomethingInTheSea.com that tell when and where something will be happening this Saturday. 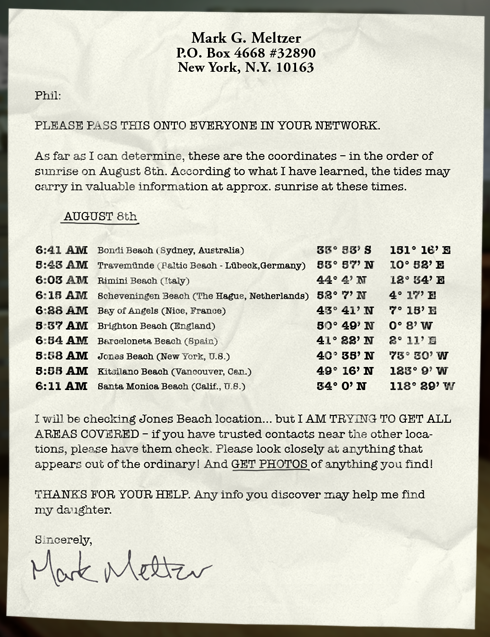 As far as I can determine, these are the coordinates – in the order of sunrise on August 8th. According to what I have learned, the tides may carry in valuable information at approx. sunrise at these times. The buzz in the Unfiction forums seems to be that there will be swag to be had at the locations, along with possible character meets, so you should have a pretty good time if you go, despite it occurring way to early in the morning. If you can, take pictures and/or video of what happens so that the people who are unable to go can live vicariously through you. And if you’re attending the Jones Beach event, say hi to my friend Siege (if he goes, that is). Thanks to Limer in IRC for telling me about this event.